A film about black magic in the British countryside. Non-believers are convinced by the end of the film that devil worshippers are to be taken seriously. 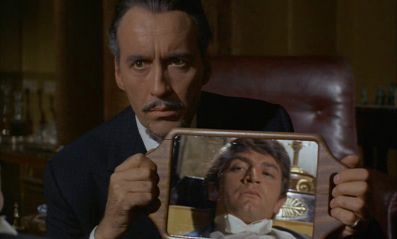 I have to assume that when Christopher Lee and company made The Devil Rides Out, they were hoping to make the equivalent to Night of the Demon or Burn, Witch, Burn. Like the older films, The Devil Rides Out tries to rely more on mood and psychological suspense, but also like the other films, terror ends up being conveyed using special effects. Unfortunately, Devil is less successful in suggesting horror, and more dependent on some obvious and unconvincing screen trickery. One aspect of Devil that remains worth watching is the opportunity to see Lee as the hero in a film. Lee's height and deep voice give him immediate authority in every scene he's in. While Lee remains watchable, the story itself is never as compelling as it could have been. Even though Devil is more scholarly in its uses of symbols and mythology, there is never any sense of uncertainty that Lee could possibly fail. Someone better versed in British culture might have a better idea, but if one was to summerize the theme of the Hammer horror film, one could say the films symbolize the triumph of Christianity over Britain's Pagan past. The Devil Rides Out starts off as a more thoughtful type of horror film which disintegrates into another variation of Dracula without blood or Dracula.